The Latest information - The ultimate news and research source for information. Hundreds of articles listed. Children's resources for Sunday School from the Bible. Find lesson plans, pictures of stone tablets and stone monuments. Find a copy of works of the moral law written out. Welcome to the ultimate web site with articles, research data, helps for children, and the latest current news concerning the moral laws of God given to Moses in the Bible and other Conservative issues. See a picture of stone tablets and photos of stone monuments. This newsletter contains a copy of current articles and issue information and has been distributed by email for many months and the response has been so positive that it is being made available in a web format. We hope that you enjoy both the web site and latest News. 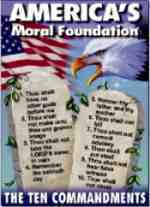 Ten Commandments Day - Observed every year in May. Click for sample church bulletin notice and also an insert to be used by your church. Simply forward info to church secretary. Alabama Supreme Court Justice Tom Parker, writes 10 Commands vs. Ten Opinions, An analysis of the recent liberal U.S. Supreme Court Ruling. Monument information. A common custom in ancient Israel. Christianity and the Constitution Christian ConstitutionOur forefathers gave us a Christian republic based on the moral law of the Old Testament. Receive current articles from The Commandment News by using the option on the - "upper left hand column" - of every page. This signup provides several options and we recommend that you check it periodically! New newsletters and State newsletters are being developed. See photos, lesson plans, and copy of monuments. This is very easy. You can use the same option on the - "left hand column" of every page. This contains not only an immediate remove, but the ability to correct name and email address. Every update notice contains both a remove link AND the personal email address of the list moderator. We try to give you the latest good news on the issues and from the Bible. You can either use the link or just place "REMOVE" in the subject of any message received and forward it written out to the list moderator. http://www.livingwaters.com/m_equip.shtml - Help every child to learn them. 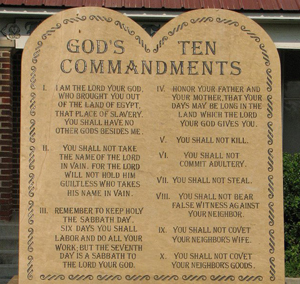 A pdf file, which is a printable copy is now available as a written out a copy of the list of the Ten Commandments. 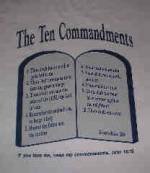 Ten Commandments Printable Copy Click to print a copy of the words of Moses from Exodus 20. A copy of a list them are also listed in Deuteronomy 5. They were written by the finger of God and given as a law of God. 10 Commandments Listed. The Project Moses, is simply the Biblical requirement to obey and display them as he told us in Deuteronomy. Project Moses To learn more about the law of God - Click Here: Law of Moses This is a Biblical perspective, a life project to learn and apply them. The establishment of Biblical teaching and the foundation for moral law. At this council held in 451 AD, leaders of the Church affirmed the basics of our Christian faith, including the Trinity. A creed was written. Council of Chalcedon Today, many associate Chalcedon with those who follow the word of God, the teaching of complete Old and New Testaments, and the obedience of the moral law. Catholic Version or more properly called the Roman Catholic Version. The story of Moses is the same. The Law of Moses is almost the same as the Lutheran. The books of Moses are essential the same, just a different translation. God Gave them to Moses to last for ever "everlasting"
Read more at God's Ten Commandments - Yesterday, Today, Forever by Dr. Francis Nigel Lee. "Click here for info about the Ten Commands Movie, Great for teaching kids"